Did you know that Vitamin C and water don’t get along? When they’re at the same party, you need to lower the ph to less than 3.5 to get Vitamin C to work (a lower ph = higher risk of irritation). Even then, Vitamin C ain’t happy. Even a few drops of water make it oxidise (i.e. lose effectiveness) faster. A lot of formulators get around this by using a more stable derivative of Vitamin C, but those usually aren’t as powerful as L-Ascorbic Acid, the pure, water-hating original. Indeed Labs Vitamin C24 took a different approach. Instead of removing the pure form of Vitamin C that’s such a pain to formulated with, it got rid of the water instead. It remains effective for longer: water speeds up the oxidisation process, making Vitamin C go bad quickly. It penetrates your skin better: usually if the Ph isn’t low enough, Vitamin C won’t work. Water-free products have no ph so Vitamin C can just get in and do its thing. Collagen-booster: it is essential for the synthesis of collagen, the protein that keeps skin elastic. When it’s around, it pumps its production up a notch or two. Skin-brightener: it speeds up the skin’s natural exfoliating process, brightening the complexion and fading dark spots. If you’re worried about anti-aging, you need Vitamin C in your arsenal. P.S. Indeed Labs Vitamin C24 contains 22% Ascorbic Acid, the same concentration used in studies to measure its ability to boost collagen. Basically, there’s enough here for it to work its magic. Related: What Does Vitamin C In Skincare Do? Sodium Hyaluronate is a form of Hyaluronic Acid. That’s a humectant that draws moisture from the environment into your skin and binds it there. Sodium Hyaluronate does this particularly well – it can bind up to 1000 times its weight in water! Plus, when applied to dry skin, it settles into wrinkles and swells up. It’s a trick that makes your wrinkles and fine lines look smaller (for a while). Yep, Indeed Labs Vitamin C24 is a silicone based cream. I know, I know. But hear me out before you start hating on silicones. Silicones have a special molecular structure. It’s made up of large molecules with gaps between them. This allows it to create a protective barrier that allows active ingredients to get through and your skin to perspire. Translation: silicones won’t suffocate your skin. I repeat: silicones WON’T suffocate your skin. Granted, all these benefits are temporary. But there’s enough Vitamin C here to give you the long-term benefits you crave. Related: Do Silicones Prevent Other Ingredients From Penetrating Your Skin? You can tell Indeed Labs Vitamin C24 is loaded with silicones. The slightly, thick, silky soft texture gives away the secret during the first application. I personally love the feel of silicones on my skin, but I know this is very personal. If you can’t stand it, this is a no-go for you. The other problem with silicones like Dimethicone? They’re water-repellent. If you apply a water-based moisturiser on top, it tends to ball up (yes, I’ve discovered that the hard way). I get around this by using it in the morning with a facial oil (Inlight Beauty Face Oil, in case you’re interested – review coming soon!). Problem solved! One more thing: my skin is pretty resilient, but even so, the first couple of times I’ve used this cream, it stung a little bit. That’s totally normal with high concentrations of Vitamin C. I’ve now built it up to daily use, but if your skin is more sensitive than mine, stick to two or three times a week. FYI, the results are totally worth it: the cream smoothed out my skin and brightened my complexion. Now, it has a lovely radiant glow and looks softer to the touch, too. I don’t have any dark spots, but science has proved that this much Vitamin C can fade them, too. Have you tried a water-free Vitamin C serum or cream? Share your experience in the comments below. 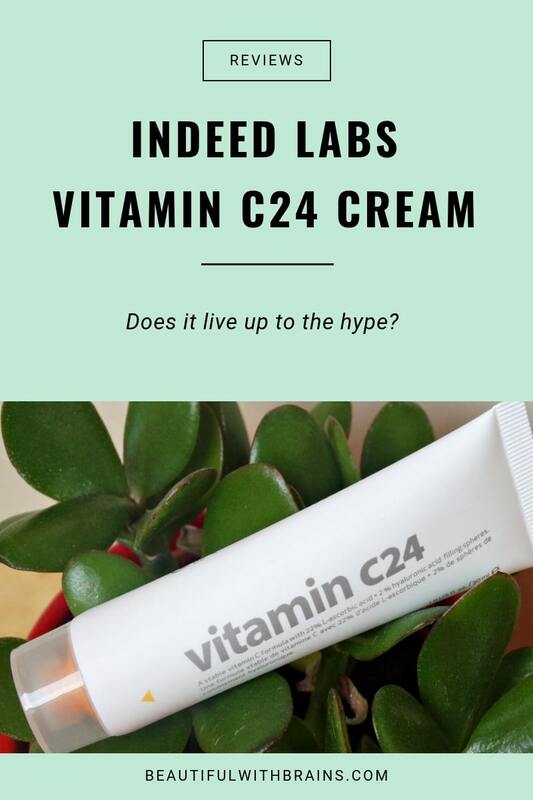 Indeed Labs Vitamin C24 is a stable, water-free Vitamin C cream with a silicone-base that prevents wrinkles, smoothens out skin and brightens the complexion. But, it stings! What Are The Best Exfoliants With Glycolic Acid? Oooooh, I love the new Bottom Line thingie! How can I get this in the US? Thank you. I’m interested to know if using vitamin c with silicone , does one put it on as first step or last step before sunscreen in am. I use vitamin c every day but after letting it work I put other antioxidants on then sunscreen. Wouldn’t the silicone block other products absorbing? I’ve just purchased the ordinary vitmamin c 30%in silicone and am so keen to know. I have my tube for 1 year and a half and only recently start using it again. It still make my skin tingle like before, so I’m quite impressed. However for me when I apply an oil on top it would pill into these noodle-like white pieces, but is fine when I apply a cream. The silicone make my skin look so flawless and poreless, I love it. It’s a bit finicky to work into my routine but once effectively incorporated, I much prefer using this than dealing with the water-based serum. Have you try the ordinary 30% in silicone? 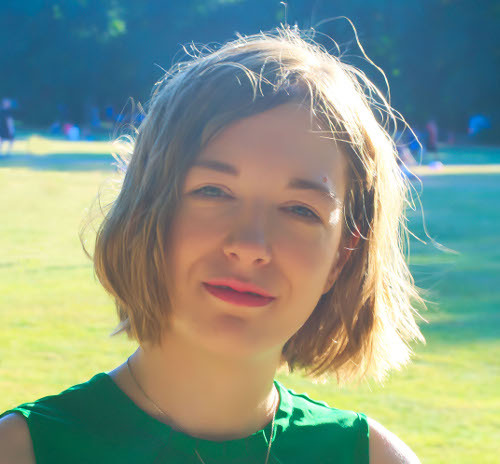 Anna, unfortunately some formulations don’t work that well together so you get that annoying peeling effect. I’m working on a post that explain why it happens and how to avoid it so check back soon. I’d say The Ordinary 30% in Silicones is a good alternative. It has a higher concentration of Vitamin C so it’s a little more irritating. But once your skin becomes used to it, you should be fine. thank you for the review. Would I be able to use this in the morning with Indeed Hydraluron? I use Tretinoin at night. Thanks. Andrea, it really depends how sensitive your skin is. This uses a very high concentration of vitamin C and if you’ve never used this ingredient before, it could seriously dry out and irritate your skin. Especially when used with tretinoin. But if you’re a vitamin C pro, you may be able to tolerate it. Great post Gio! I just got this cream, full size as a complementary gift, when I made an online purchase of some cosmetics. I searched the reviews and that’s how I found this post and your site. 1) Which non water-based moisturizes would you recommend for combination skin for a 45-50yr age person? 2) Would applying this C24 cream first and than waiting some time before applying a moisturizer (for Vit. C to do what it supposed to do) make sense, and if so what is the waiting period? Katarina, I think your best would be too apply an oil like jojoba or rosehip 5 minutes after C24 cream.